2 bedroom, 2 bath condo On HUGE beach,quiet area,walking distance to everything! PRICE QUOTE REFLECTS THIS SALE PRICE. BEST RATES ON THE BEACH! This 2BR/2BA condo is first floor, centrally located in the complex closest to all amenities, and the closest unit to the pools (heated when cool). When you step outside to the covered patio, you are within 20 feet of the pool; walk to the opposite side of the pool, and a few stairs take you directly to the white-sugar sand beach. Relax in the evening to the sounds of the surf through the open bedroom window. This condo is fully equipped with many extras! There is a whirlpool tub in the master bathroom. The living area has cable 55" Smart TV and DVD, along with cable TV and DVD in each of the 2 other bedrooms also. The guest bedroom also has Nintendo. A stereo/CD unit is in living area. The kitchen is fully equipped with cookware and appliances and also includes a large capacity under-counter icemaker in addition to the refrigerator icemaker, and washer and dryer. This condo comfortably accommodates up to 8 with a king-sized bed in the master bedroom, queen and bunk bed in the guest bedroom with a chair that rolls out into a bed, and a queen-sized sleeper sofa in the living area. All linens and towels are included, but we suggest bringing beach towels, if you prefer, and sunscreen! This location is away from the main traffic in a quiet area, but walking distance to many restaurants, groceries, and the area's largest outlet mall, Silver Sands. The beach area is over 600 feet (more than 2 football fields wide!) --the area's largest beach per condo ratio. Lots of room to spread out on the beach and never feel crowded! 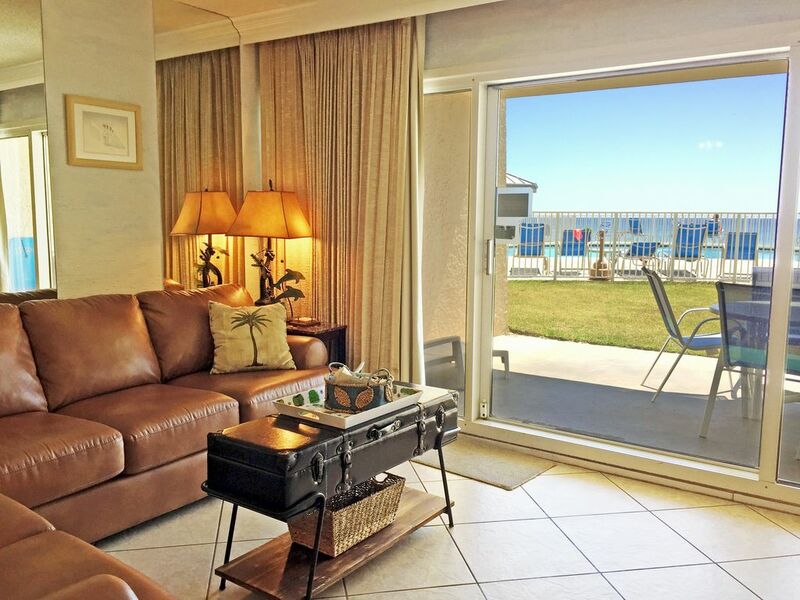 The physical address is 675 Scenic Gulf Drive, Miramar Beach, FL 32550, condo C104. Resort amenities include complimentary beach service (March-October), complimentary secure WiFi, two pools-- large (heated in cooler season) over-sized pool and smaller kiddie pool. While at the pool you have an awesome direct view overlooking the Gulf of Mexico! And right next to the pool is the gazebo that also directly overlooks the Gulf of Mexico, a great place to meet friends and celebrate the sunset! There is a video game room, 2 lighted tennis courts, shuffleboard and fitness/workout room. The fire-safe grill area with gas & charcoal grills are available any time and located next to the clubhouse. In the clubhouse you will find a large meeting room with games, computer access & a large screen TV. There are also kayak and other beach rentals available onsite with jet skis & parasail very close by. There is a hiking/biking trail that goes for miles along Scenic Gulf Drive that you can access by just walking across the street from the condo. NO PETS & NO SMOKING INSIDE CONDO. Perfect location!! Quiet location but close to everything, hidden jewel!! Owner was great!! Very hospitable and made us feel like a true house guest. Provided us with all this great information and made sure we were taken care of and were knowledgable of the things we could do in the area. We've been to the area before but this beach is by the far the most beautiful!!! Awesome vacation. We will be returning for sure!! Beach and pool location was awesome! Did have to drive to restaurants. Only one within walking distance. Clear water and white sand beach! I am DELIGHTED you had a great time and everything was good with the condo! I'm sorry there was any confusion about the walking distance to restaurants. It is about 150 yards east to the Surf Hut and about 900 yards west to the Whale's Tale. For young children that latter could be a walking challenge. I'm sure other guests will appreciate knowing that. Thank you for visiting! Enjoyed our stayed. By far the best condo for access to the beach. Everything was very nice & clean! Highly recommend! Jan had a welcome bucket waiting for us with all kinds of goodies inside. We really enjoyed our stay and loved the updates condo. The attention to detail of the owners was amazing. Everything was organized and easy to find. They had everything we needed. It was in the perfect location. Gate opens directly to the beach. We will be back. The best condo we have found in the area. We returned to Jan's beautiful condo and found even more reason to book our vacation there. The new wood table and chairs in the dining area add a warm homey touch to the open room. The new granite countertops have been lowered to the height of the kitchen counters and make the large room seem huge. The wooden bar stools are an added plus. The comfy leather couch is perfect for an afternoon nap or watching the 55 inch TV. From the master bedroom we listened to the soothing waves as we fell asleep. And the guest bedroom is perfect for additional guests and children with the queen bed and new bunk bed. Then we stepped outside to see the nice patio, heated pool and great view of the Gulf of Mexico. We watched beautiful sunsets from the beach house grass overlooking the sugar white sand. Jan is a super owner who really goes the extra mile to make guests comfortable and feel right at home. The two bedroom condo cannot be beat for comfort and convenience to restaurants and shops in Miramar Beach. Thank you so very much for taking the time to share your experience. We are delighted you enjoyed your visit and look forward to seeing you again!